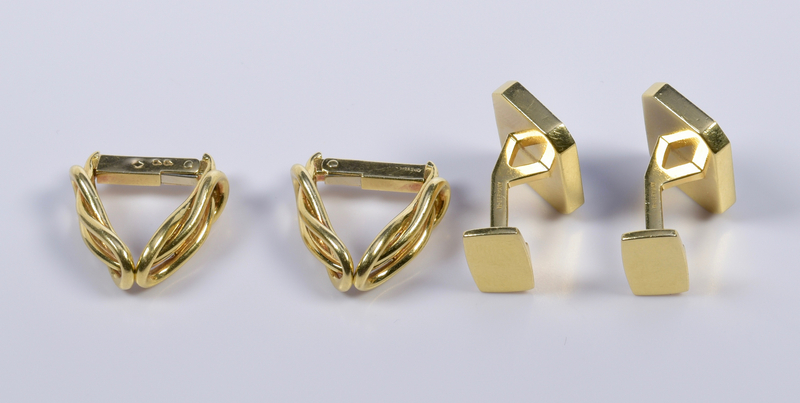 Two pair 18K cufflinks, one by Hermes and one by Black, Starr & Frost. 1st pair: 18K yellow gold nautical square knot cufflinks with hinge post, French hallmarks and marked Hermes-Paris on post. 3/4" L. 14.3 grams, pair. 2nd pair: 18K yellow gold mother-of-pearl and black onyx cufflinks, rectangular with shaped sides, 3/4" H x 9/16" W, marked 18K, BS&F with hallmark, W. Germany on reverse of post. 15.5 grams, pair. Provenance: Collection of the late Edwin and Rebecca Raskin, Nashville, Tennessee. CONDITION: Hermes pair with scattered surface scratches. Black, Starr & Frost pair with scattered surface scratches and nicks on cup edges.